Yes, the ribs are easy but the formers are more fiddly - I cheated and got my father-in-law to cut them out with his electric fretsaw! Would certainly consider the Sarik parts if I were building another, but I'm a lazy so-and-so. Interesting comment on the sheet tail Peter. I built mine as per plan, but another alternative is to use a 1/16 sheet core, then 1/16 ribs and outline either side of it. Probably negligable weight saving over solid sheet, but stronger than the skeletal version while maintaining the built-up appearance, if that matters. Trevor Pete is talking about vertigo I believe. Ah, lack of attention to detail on my part! NO I was talking about the Ohem. I designed for saving weight at the rear and then had to add lead. Later I cracked one side of the tailplane and had to add a strut to support it. A sheet tailplane is now a standard reccomended modification. But I'll also note Peter's recommendation for a solid sheet tailplane, given that lead was ultimately required at the rear to balance. Thanks for explaining your reasoning Peter, now I understand. I have decided to try a mod. on the fin/rudder because application of rudder pushes the tail up, not down. This prevents mine from performing an upright spin (it will do inverted ones), also I have found it very noticeable on take off if using a lot of rudder, when the nose gets pushed down. 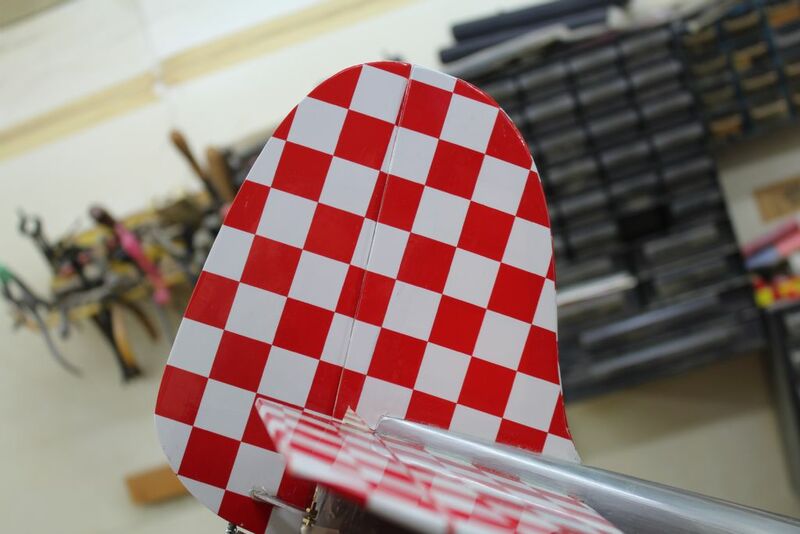 What I have done is to angle the top of the fin rearwards by 3/4" to give it some rake back and make a new rudder, keeping the area of it the same. This worked on single channel models in years of yore so that they could be `buttoned up` by waggling the rudder just after launch. Just finished the mod. so will let you know soon if it works. That is interesting. I had not noticed that. However I remember a discussion with Alistair Sutherland (I hope I got that right, it was a long time ago) WE where discussing Knife edge flight and he said that when the elevator extends over the area of the rudder the model tended to pitch nose down in knife edge. I don`t think it is much to do with the elevators extending over the rudder since all of my aerobatic models and many others capable of aerobatics are built like that. The fin rake angle, if any, is however critical. Many other factors are at work here as well, just to make life more difficult. I must see how mine spins. I have spun it but can't remember any problems. Tried it today and it will spin without any other changes. Still pushes to the u/c in KE, more so left than right so increased the rud/el mix. I tend to fly with the least possible throws so it would stand much more elevator on high rate. I am probably being a bit picky here since this really is a pleasant model to fly. So on balance then Martin, perhaps not worth modding? I recall various mods for the Acrowot being mentioned/tried, and some of those were aimed at supposedly curing a pull towards the u/c in knife edge. An increase in tailplane area along with dropping the tailplane to a mid fus point rather than on the top. A sub fin was another. I am intrigued at the reference to rudder elevator mixing. I just use the sticks separately. Percy, I would yes, it is worth doing. Maybe even 1" rake back. Peter, it makes use of your computer gear and life easier. No more hit and miss. Ah!! Do you think that the pilots of Extras etc.rely on computers and mixers to perform properly? Do they stop after each flight and think "I want a little more rudder or elevator or ailerons mixed in to get that perfect"
No, but they do not have to wait and observe an error as we do. As a former twice British F3A team member and British champion I would almost have given my right arm for the radios we have today. We had to keep tweaking various bits of the design to get things as near perfect as possible. Corrections became automatic reactions after many hours of practice. I can still do it but prefer to take the easy way out. Every time I fly my Sebart Angel knife edge, I promise myself I'll mix in a little up elevator with rudder, then promptly forget! Haven't played with KE much with the Ohmen yet. Martin makes a valid point in that we are not sitting in our aircraft, so it takes us longer than a full-size pilot to perceive that a correction is needed, and how much to apply. Mixing is a great help in this respect. My most frequently used mix is CAR, engaged on high wingers and biplanes because I haven't got a turn and slip indicator to look at. Nothing wrong with doing it all with your eyes, brain, fingers and thumbs if you prefer though Peter. You are correct of course Peter, but if the model in question is near enough anyway then this does not become too much of an issue. I have only built one design, the Dalotel, which rarely needs electronic or manual correction. I am now on about my eighth one, between 48 and 78" spans. Still have three. Amazing since only one full size prototype was ever made. The only other model I have which comes near to this is a Curare.